First read Wisdom of the Crowds (and Voting). There are in this great land of ours some 315 million souls. Citizens, I mean. Another 12 millions (or so) are, as the euphemism goes, undocumented. If democracy is defined as one-man-one-vote then democracy does not exist in the USA for the very simple reason that only about seven out of ten are permitted to vote in national elections. And even those eligible are not allowed to vote on everything. It’s true, I promise. Somewhere around one-third of all people are forbidden to vote for candidates for office. And the numbers barred from casting ballots in other governmental matters? Monumental. Are you scandalized? Is this an affront to Equality, that great and noble goal? Should we march? In a “pure” democracy everybody votes on everything. We are thus not a pure democracy, but something else (we used to say “republic”). Some think a pure democracy undesirable because it is absurd. It is absurd because most of us do not want infants and children voting (but then we’re not all progressives), and we do not want citizen-wide votes on every matter which arises. Ask yourself what receives more praise than Democracy, that system as bad as all the others except somehow superior? Why, it even garners more veneration than diversity! It is so wonderful we’re intent on exporting it by force. Peoples will be democracies, we say, even if it kills them. 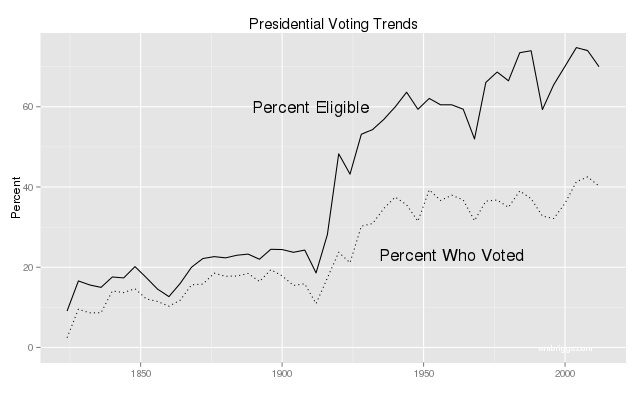 The percent of citizens eligible to vote in presidential (a position of increasing power) elections has been inching ever upwards, and so has the percent of voters who showed up.1 Some of this increase is due to structural changes, such as the fifteenth (race) and nineteenth (women) Constitutional amendments, but more interesting to us is the twenty-sixth (extending the vote to 18-year-olds); and some change is due to shifting age distributions (the greater the proportion over eighteen, the more eligible to vote). Citizens have also been encouraged to vote in more matters, such as latterly for Senators (seventeenth amendment), or directly for legislation, thus far only at the State level (right, California?). This is all in the direction of pure democracy; however, nobody, except possibly academics, thinks we’ll ever get there. It’s become a staple of talk radio to quiz dazed-looking folks as they exit polling stations in presidential elections. Oddly, few of these voters can name the Vice President, almost none know the Secretary of State. How many can define (say) the difference between the deficit and the debt? Or could name the ambassador to China? Ignorance abounds, but still people vote. And let’s don’t forget ardor: voters sure love their man. Why vote? Because there are disagreements. Why are the disagreements? Because there is uncertainty in the sense that people base their decision on different information. People also have differing near-term or small goals, though presumably voters share the meta-goal of “making a better country” (or whatever). And so finally we return to the Wisdom of the Crowds, which has (as we showed) three forms. Averaging votes—here, as a guess of the best man for the job—can work when the crowd is operating on (largely) unbiased information, when they have some clue about the real answer but have uncertainties that vary from person to person. Elections for small-town council members are a good example. So is voting where to go to lunch. Wisdom of the Crowds can also be a formal fallacy. When a crowd is ignorant of its subject matter it cannot reliably provide accurate guesses, i.e. good votes. Darts thrown blindfolded are just as dependable. Votes of ignorant crowds will in general be harmful. High school seniors escorted to the polls on a bus driven by democracy-loving teachers is an example of a voting bloc best stuck in traffic. The third and most insidious form is biased information. Averaging biased votes gives biased resultes. Now a good proportion of populaces in democracies imbibe willingly drafts of information from sources far more dubious than the moustachioed man from our last example. Bias therefore abounds. And must, necessarily. As the proportion of a population eligible to vote increases, both ignorance and susceptibility to bias must increase. This result assumes the tacit premises that intelligence is subject to variation, which most accept, and that the young are less wise and more swayable than the old, which everybody believes. The result is that the closer a state comes to a pure democracy, the larger the mistakes it is capable of making in voting. I think many already know this, but mentioning it is considered gauche. 1Population data was compiled from the US Census Bureau, with linear extrapolations between decades prior to 1900. Turnout was found here and here. The percent turnout differs in different sources: it is often an estimate, which means it is the product of statistical models, the precisions of which I don’t know. Meaning, all results above are not entirely certain. Also note that the Asimov story takes place in the year 2008. The future is not what it used to be. “The future is not what it used to be.” Amen to that. Shall “the closer a state comes to a pure democracy, the larger the mistakes it is capable of making in voting” henceforth be known as Briggs’ Law of Crowded Voting? I find the time series graphs strange. Where do the sharp dips in the Eligible series come from? For instance, there are two dips in 1950-2000, one from about 60% to about 52% around 1970, and one from around 75% to 60% around 1990. These can’t be wars – Vietnam didn’t kill almost one sixth of eligible voters. Were there some restrictions on the franchise (or equivalently, sudden and very short influxes of non-eligible people) within recent memory that I’m not aware of? Everything else that has been tried does even worse than democracy. I would suggest looking for shifts in demographics. Changes in the age profile of the population, or in the citizen / alien ratio. For example: A baby boom would increase the % of the population that is too young to vote. A surge in legal immigration could also reduce the % of the population eligible to vote. Gauche? I think “Droit” is the new “Gauche”. Short term fluctuations in the graph are probably due to demographic effects. Large up-ticks in births (e.g., 1946-64) would increase the population w/o immediately increasing the voting eligible. The dip in the 90s is probably due to immigration. “Extraordinary Popular Delusions and the Madness of Crowds,” by Charles Mackay. Published originally in 1841, and still in print (still in print after well over 150 years — that tells you something). What Mackay tells (or reminds) us is that crowd behavior is very emotional and quick to pounce on minimal information and then go off hysterically to an illogical & unsustainable extreme, at which point the contrived & nonsensical situation crashes catastrophically back to sensibility (that is, “common sense” becomes nonsensical until it invariably restores to sensibility after sufficient damage is wreaked). The first 100 pages or so of the book are mandatory reading in many business school finance programs/courses for its description of a number of investment manias, the basic patterns of which still repeat (it is from this, I’m pretty sure, the term “bubble” originated…as in the recent “housing bubble,” and so on). “The larger the mob, the harder the test. In small areas, before small electorates, a first-rate man occasionally fights his way through, carrying even the mob with him by force of his personality. But when the field is nationwide, and the fight must be waged chiefly at second and third hand, and the force of personality cannot so readily make itself felt, then all the odds are on the man who is, intrinsically, the most devious and mediocre â€” the man who can most easily adeptly disperse the notion that his mind is a virtual vacuum. The obvious solution is to decentralize the power. We must assume that we will occasionally vote-in an idiot. So, we can’t give him too much power to screw things up. Gorgasal, experimental error? There are no error bars on this graph. MattS “Everything else that has been tried does even worse than democracy”. Are you sure? How has this been determined? One has to especially watch out for confounding factors such as advances in technology, in trying to make such an argument. Decentralization, a.k.a. subsidiarity. Just so. But, as the 17th Amendment shows and these plots show, we’re moving in the opposite direction. I have a phone and a pen! 315 million resident citizens? Really? I am afraid I am far from convinced that everything that has been tried has been worse than democracy. Indeed, the relatively brief history of America, as hinted at in the article and while far from conclusive, serves to undermine that assertion. There seems to me to be a fairly close correlation (in the civilian sense, myself not being a statistician, just so we’re clear) between the expansion of the franchise and the rise of barbarism in this country over the last two centuries. I too appreciate Churchill’s eloquence, and I would really very much like to believe the assertion is true (it would be a great weight off of my mind), but I must ask for more than a simple rephrasing of an eloquent assertion as a basis for belief. Before you respond, please note that a very large portion of the Federalist Papers were spent explaining why this nation was not like so many other democracies that had failed in very short order as such things go, indicating that at least three of the most ardent and eloquent defenders of the government that has been more associated with democracy than any of its contemporaries believed that including too much democracy was a significant risk, given their knowledge of history, particularly classical history. “Motor Voter” laws have always bugged me. Some people just shouldn’t be encouraged to vote. Voting is a bit pointless when there is no clear difference between the choices or, worse, when it amounts to a selection between two evils. It seems we have a choice between lunacy and Fascism. Which did we get? I agree that voting is difficult and often pointless when the candidates all sound alike. The solution there is to get actual candidates, not to stop voting. Yes, easier said than done. But honestly, the “easiest” form of government is “dictator” where you have no choices whatsoever and no way of dealing with the mess. Life may be hard under a dictator, but the government part is “easy”–it’s a given. Easy is not really a good idea when it comes to government. Voting in a democracy aside, I’m trying to understand your (Briggs) real objections to prediction markets or the Folly of the Crowd, as you could have named this thread. It’s clear that you see no value in their predictions when participants have no knowledge of the subject. What are the conditions under which this is true? Are there specific categories of questioning that you feel are particularly vulnerable to this risk? How does this explain the facility PMs seemingly have wrt to election outcomes (consider the 2012 Presidential election predictions on the Iowa Electronic Markets), Oscar predictions (HSX.com), the arena for so-called “long bets” (http://longbets.org/bets/). So, help us understand a little better what the real objections are. Help yourself, Thomas, old son. Read the links I provided where I outline the very objections you ask about. Briggs…dunce that I am, after perusing your two posts on prediction markets, I can’t find the links you mention. In the Cities in Flight novels by Blish, US democracy had descended into a bureaucratic tyranny resembling the old Soviet structure. those leaving (at least NYC) had settled for control by the City Fathers who were computers. Not sure which is worse, being controlled by a “rational” Median Majority or a super-rational AI. There’s no reason to think an AI wouldn’t have its own self-interests that come first. (I have no idea whether HTML works here – if the stuff below is gibberish, the bottom line answer is that “knowledge weighted” voting (I know, duh) would have seen him and Palin elected with about 88% of the vote.